Soon after I started making Perler Bead creations, I wanted to do more than make simple geeky figures. I wanted to make something that could be worn around. 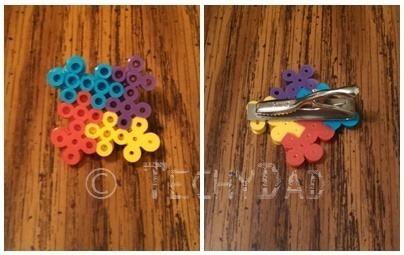 I started off by making an Autism awareness puzzle piece tie clip. With this done, I noticed that they could make good earrings as well. All I needed to do was get some earring hooks from the craft store and hang one of the puzzle piece edges off of it. 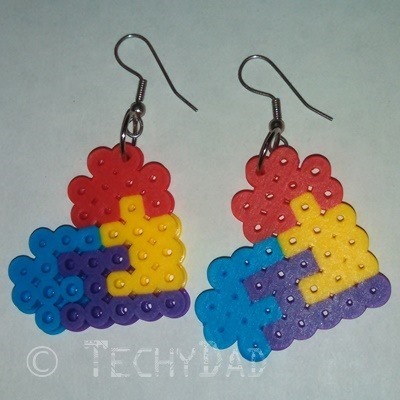 I asked B if she wanted me to make her a pair of puzzle piece earrings. While she liked the puzzle pieces, she was concerned that they would be too big. After experimenting with some parrots (not-autism related – just a pair of small parrots that still might be turned into earrings), I decided to try making some Autism awareness puzzle piece hearts. First, I "sketched" out a heart shape using black pieces. Next, I slowly replaced the blacks with blue, red, yellow, and purple. Then, I filled in the shape until I had a complete heart. Finally, I moved pieces around until it looked more like puzzle pieces interlocking. After ironing, it was ready to be made into earrings. I was prepared to do this part myself, but a friend offered to help as she had all of the supplies, has made earrings before, and enjoyed doing this. I believe she wound up doing a better job than I could have done. And so, B now has a very nice pair of Autism awareness earrings to wear. Now comes the question: What should I make next for B? Any suggestions?